Fast Company reports on ongoing internal strife at Apple over the company's use of software skeuomorphism, the inclusion of certain ornamental elements in a product that are carried over from previous tools addressing the same task for which the elements were required for functionality. Daring Fireball's John Gruber has linked to the article, noting that he has heard similar word of an "internal political divide" over the issue. 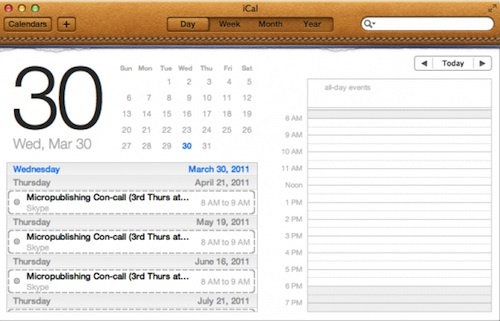 One of the most frequently-cited examples of questionable skeuomorphism in Apple's software is the company's set of calendar apps, which have recently used a stitched leather design reminiscent of physical desktop calendars, complete with the remnants of torn-off pages visible near the binding. Game Center, which is presented as a gaming table complete with wood grain and green felt, is another oft-cited example. Says the former senior UI designer at Apple, "I feel like [Apple] has concentrated too much on mimicking the visual skeuomorphic approach rather than concentrating on the actual functionality." For example, in iOS 6, the latest version of Apple’s mobile operating system, Forstall recently demoed an animated paper shredder, which will be used to delete e-tickets and coupons. How many iPhone users have ever actually seen a paper shredder in real life? Is it necessary? Or just visual masturbation? "To me, it’s lipstick on a pig," says the source intimately familiar with Apple’s design process. "There’s no need to add glitter if the product can stand on its own." The report points to Windows 8 as an example of how companies can bring fresh user interface ideas by minimizing reliance on skeuomorphism to try to replicate experiences that may no longer be optimal or even relevant. A follow-up report will be examining the issue from Microsoft's perspective, with the conclusion of today's report hinting that Microsoft sources have unflattering things to say about Apple's approach. Is visual masturbation a bad thing? Steve would never have allowed thi -- oh wait. I am fine with Game Center, but please change the osX versions of iCal and Address Book. I didn't upgrade to lion for this reason, and now that my new Air comes with it I want to vomit every time I see it. You didn't upgrade to lion because you don't like the ui design of two programs? Meh, iPhone 5! iPhone 5! Never thought I'd see the words "visual masturbation" on MacRumors. Skeuomorphic features in iOS are like mock-tudor beams on a Bauhaus building. I've often felt Garage Band was an excellent example of these so called "skeumorphisms" done well. The iCal picture shown is tacky, but I haven't seen anything in iOS that draws my ire. Mostly just cute or whimsical touches that harken back to the paper world. edit: 4 comments in and I'm the first meaningful one. I'll try to be faster next time.